Running from August 8 to 20, Sydney Science Festival brings some of the most exciting names in science together for a spectacular exploration of our world. 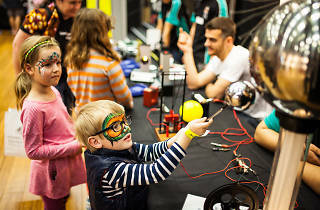 With 150-plus events on the roster, punters can get amongst a range of talks, events, exhibitions and workshops for science fiends young and old. While it’s going to be impossible to see everything, we’ve curated a bunch of top events to keep an eye out for. Discover the strength of the human voice in this immersive exhibition. Delve into the human voice and experience how it locates us socially, geographically and psychologically. By taking this acoustic journey of theatre, video, visuals and sound, attendees can learn how meaning and emotion are conveyed through the patterns of rhythm, stress and intonation. Immerse yourself in the bizarre sensory world of animals in A Night of Illusions, an evening packed with tactile and optical illusions that will twist and change before your own eyes. The event will also feature talks and interactive demonstrations from scientists who will invite guests to step into a realm that will challenge assumptions and alter perceived realities. Ever tasted a cake so good it made you question reality? This tasty event will delve into silky chocolate ganache and crumbly sponge to figure out the science of baking. Research scientist Subha Nasir Ahmad will lead a talk about why cakes are the way they are, how you can achieve cake perfection at home and give insight into her science-inspired Brainbow cake. Is there life on Mars? It’s the question David Bowie famously posed, and it's currently on everyone’s lips. At this discussion moderated by Catalyst’s Graham Phillips, guests can hear from a panel of NASA scientists and astrophysicists as they discuss the potential for Martian life and the looming robotic mission to search for habitable conditions on the red planet. The Madhouse Effect: What Is Stopping Action on Climate Change? What’s stopping action on climate change? What are the factors that push governments to inaction? What role can businesses and the community play? And what can we do if we want effective climate change action? This panel brings US climatologist Michael E Mann, psychologist Stephan Lewandowsky and activist Anna Rose together to share their suggestions on how to break the climate change stalemate. 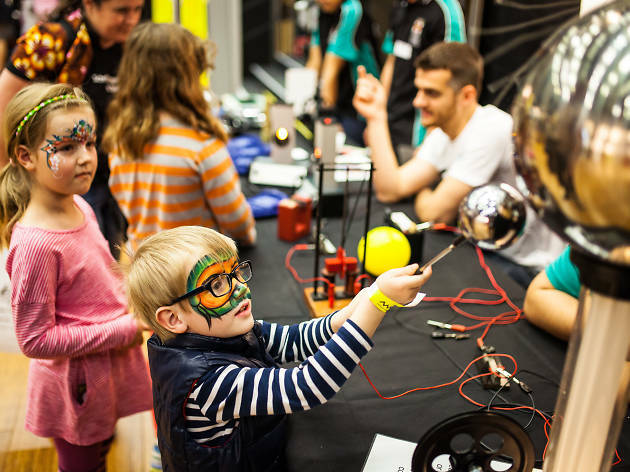 Head along to the Australian Museum Science Festival (AMSF), Australia’s largest school science festival, to celebrate National Science Week. From August 8 to 18, science-based programs, events, workshops and talks for school students will give everyone a hands-on experience. Ask the hard questions, try some experiments and speculate about the future of science. The famous radio segment goes live! Dr Karl and Triple J presenter Zan Rowe will present a live version of their long-running Ask Dr Karl segment at the Powerhouse Museum. There will, of course, be plenty of audience participation so be sure to bring along your biggest science questions along with you. In its essence, BAHFest is a celebration of well argued, thoroughly researched but completely incorrect scientific theory. Speakers will present their bad theories in front of a live audience and a panel of judges (who all have real scientific credentials) and together determine who will take home the BAHFest trophy. Two teams of scientists will use their knowledge and wits to battle it out under the watchful eye of comedian and host Adam Spencer and brains trust Dr Karl. This comedy quiz show will be about the survival of the fittest – plus attendees can win prizes of their own. See a dinosaur roaming Centennial Park, discover the science of chocolate, play with science toys and create giant bubbles at Science in the Swamp. This fun, family-friendly romp at Centennial Parklands brings together all kinds of science fun, demonstrations, experiments and ideas. You’ll be able to join bat and bird spotting tours, learn about venomous snakes and more. Learn from academic and research scientists, Indigenous Elders, student peer educators and other outreach and community leaders at this family fun day at Redfern Community Centre. The day will celebrate Indigenous and Western science, as well as Indigenous youth and Elder achievements through hands-on science shows, activities and talks. See wildlife through the eyes of a scientist at the Wild Science Race at Taronga Zoo. Attendees can test their skills as a scientist, compete in challenges, explore current research projects and expand their wildlife knowledge as they travel around the Zoo in a timed race. Don your deerstalker and dive into the fabulously intuitive world of the world’s most famous detective. On now until October 8, this exhibition at the Powerhouse Museum allows Sydneysiders to interact with a recreation of Sherlock Holmes and Watson’s sitting room, alongside original Arthur Conan Doyle artefacts. The exhibition will be an interactive journey into Sherlock’s world, whether you know him from the books, the movies or the TV shows. Love CSI and Sherlock Holmes? This keynote by Professor Shari Forbes, a leading forensics expert, will touch on all things forensics, death and decomposition. She studies the decomposition of human corpses at the Australian Facility for Taphonomic Experimental Research (AFTER), known also as the ‘body farm’, a UTS facility that’s integral to human death investigations in Australia and around the world. Did you know that maggots in a corpse can tell you a person’s time of death? Or that genetic fingerprinting of smuggled animals can help fight illegal wildlife trade? This two-hour lecture will touch on the cutting-edge techniques used by wildlife detectives and the insects and animals that are helping to solve crimes. While we’re aware some animals give birth to live babies, rather than laying eggs, we know very little about pregnancy beyond mammals like ourselves. Thankfully, Dr Camilla Whittington is leading the charge to change this. In this lecture she'll touch on the cutting-edge techniques she's using to identify pregnancy genes. Following the lecture, attendees will be able to take part in hands-on activities and displays. It’s predicted the earth will have a population of nine billion by 2050, so what are the resources we’ll need to solve the problems of a growing population? Grappling with issues of sustainability, food and energy security, UTS scientists are spearheading a bio-economy based on microalgae, the tiny microscopic plants that have the potential to revolutionise the food we eat, medicines we take and the energy we rely on. Learn everything you’ve ever wanted to know about algae-based biotechnology from Professor Peter Ralph, director of UTS Science’s Climate Change Cluster and founder of the NSW Deep Green Biotech Hub. Drink while you science? Don’t mind if we do. This session focuses on the role plants play in alcoholic beverages – think hops in beer and agave in tequila. Meet local makers, taste their products and learn the science behind how wine, beer and gin are made. This event will kick off Sydney Science Festival and allows patrons to explore the Powerhouse Museum after hours for free, meet experts, get creative with a range of hands-on activities, tour exhibitions, chat with curators and see the Museum in a whole new light. You can also escape into virtual reality and drive a Mars rover across the Museum’s Mars Lab.